He laughs a lot when he speaks. He says that whenever a group of men gather around a good cigar, he is happy. He jokes and moves his long-fingered hands with ease. He knows he is being watched through the black camera lens, but he looks at his interviewer confidently. Today I’m not the one asking the questions; I’m there more as a spectator. The afternoon is too chilly for my dress, but he is wearing a long-sleeved greyish-blue shirt pleated along the front like a guayabera. In 1977, when he was 34, he decided to try his luck in a company where he could work not just as a publicist but as a designer of the product. The doors of Hunters & Frankau, exclusive distributors of cigars in the UK until 2009, opened for Chase as he headed up the firm’s marketing department. He now owns his own consulting firm: Simon Chase Limited. He has written books, collaborated on magazines and Internet blogs, and gone on the lecture circuit. He is recognized as the most important source of knowledge about the history of the Cuban tobacco industry. Chase is the keeper of an incredible amount of historical information about the Cuban cigar tradition and he knows all the ins and outs of the products, past and present. For example, he tells us that recently cigars have had to be made in shorter lengths, especially in Europe where health regulations force people to smoke out of doors and the cold climates often do not let people stay outside too long. On the other hand, they are also being made thicker. Too much so perhaps for his taste—he appreciates elegance just as much as a good smoke. Simon Chase has lost track of how many times he has visited Cuba since that first time in 1985. 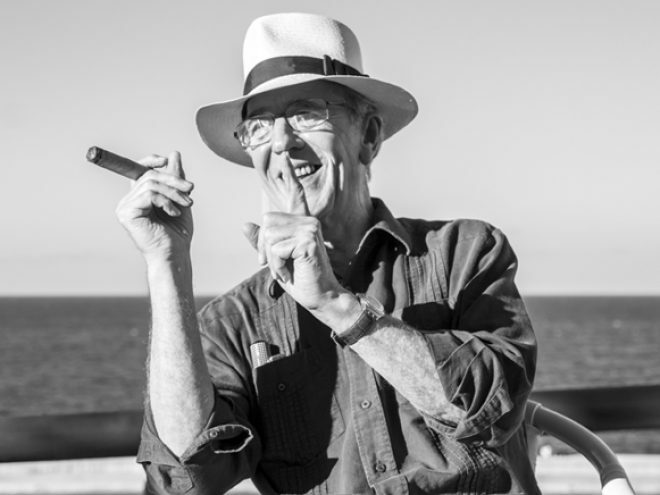 He has not, however, lost the pleasure of coming to the Island to take part in the Habano Festival as a permanent guest. Simon is the star at the auction that collects substantial sums of money, which is traditionally donated to the Cuban public health system. He tells us anecdotes about his beginnings as auctioneer, from the first terrifying night in 1999 when his only previous experience had been auctions of homemade jam at community festivals and his only training took the form of a telephone conversation with Duncan McEuan, the chief wine auctioneer for Christies in London. McEuan kindly taught him a few tricks to use during bidding and said, “Whatever happens, always smile.” Perhaps that’s why he is always smiling these days. Nearing the end of the interview, he accepts a mojito. As I leave, I look back to see his silhouette, hat and cigar outlined by the Cuban sky. Next year, we will be welcoming him again to pound the gavel at the end of yet another auction and to share the pleasures of cigars in Cuba with friends and customers.